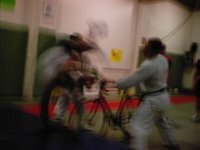 This is great..Here is Matt Allen being flipped off of a bike by two judo experts. Matt is in Belgium racing or the Cycling Center and they were sent to the local Judo Gym to learn how to crash. This looks like a great exercise for all cyclists and triathletes to incorporate into their training.